Tennessee Dutch Shepherd Rescue View other Dutch Shepherds for adoption. I have a beautiful boy named Cesar. He is somewhere around a year, probably closer to 2 now. We rescued him from the Bedford County Animal Shelter in February. As time goes on, I really don't know if we're the right home for him. He's probably the most active dog I've ever had. He's also the oldest 'puppy' I've ever adopted. My husband and I are in our 50's and we have three other dogs. Most of the time he needs to be tethered in the house. He just can't sit still for very long. I think he needs a job. I also feel he could benefit from some specified training and a fenced yard. He's great with the other dogs. However, my two little ones aren't as eager as he is to play. They're 10 and almost 7, that and Cesar doesn't realize he's way bigger than their 17 & 12 pounds. He really loves our pit mix, because she plays with him. But they get crazy! They have actually knocked over the love seat while playing. He's also good with my 5 year old grandson. When we adopted him, they said GSD mix, which he has that face, but he's lankier than a GSD. 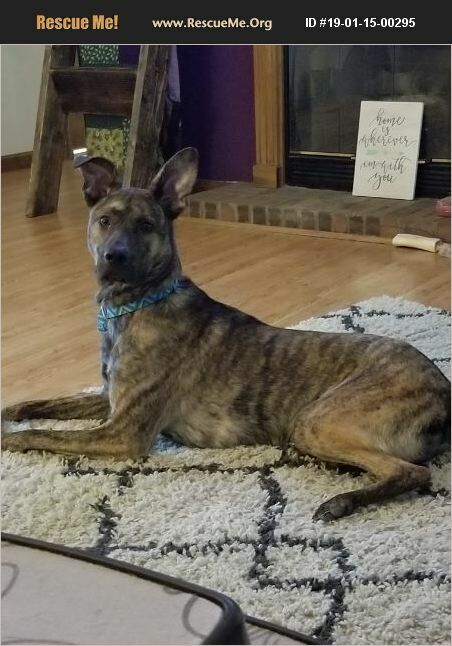 I had someone ask me if he was a Malinois or Dutch Shepherd . I did some checking and I think he is a mix of them. He can jump like no dog I've seen before. Anyway, bottom line, I think we're doing him an injustice by keep trying to make this work. He tries so hard to be good. He is a fast learner and if I had more time, well it would be great. I'm gone at least 9-10 hours a day and my husband at least 12. I would even consider donating him to be a service dog. Can you please help us? Cesar deserves someone that is more active and has the time to train him. He's sweet, beautiful boy, who wants to be a lapdog! Adoption fee could possibly be negotiated. I'm not in this for the money, just want a great fit for him. Any adoption fee collected will be donated. Thank you so much!